The DeQuincy Railroad Museum Board of Directors is pleased to announce the display of an extensive collection of model steam and diesel engines at the 1923 Kansas City Southern depot which is listed on the National Register of Historic Places and is located in downtown DeQuincy. The valuable collection was donated to theDeQuincyRailroad Museum in August 2006. In addition to the permanent display at the museum, there are also items displayed at the DeQuincy City Hall, the DeQuincy branch of the Calcasieu Parish Library, and two local banks, City Savings Bank and Chase Bank. The items displayed at the banks will alternate and will rotate in the future to Iberia Bank and Capital One Bank, also in DeQuincy. The engines on display are exceptional in their detail and craftsmanship. Manufactured by Samhongsa Co Ltd, Row & Co, Adler, and Marklin, they are made of high quality brass and contain the standard electric motors associated with toys, but are scale museum-quality models of actual steam and diesel engines. The scale is referred to as Gauge 1, which is similar to G scale, and runs on G scale track, but each is constructed to the exact specifications of their prototypes. Most of these were produced in the 1970’s and 1980’s and very few Gauge 1’s are produced today because of the level of workmanship and the associated costs of their production making these exceptional examples of the art of model making. Each of these engines has special wood and brass cases finished like fine furniture and dense foam interiors to protect the models. These models represent some of the largest and most popular trains of the twentieth century. Beginning with a design concept by former DeQuincy resident Frank F.Douglas of the Douglas Group in Houston, the planning and execution of the display evolved over several months. Blaine Miller, Assistant Director of the Imperial Calcasieu Museum, directed and oversaw the technical aspects of the project with the assistance of Gary W.Cooper and Harry Methvin. The display is presented with state-of-the-art museum quality signage and lighting in a large antique wall cabinet donated to the museum several years ago. Funding for the project was by the City of DeQuincy. The collection may be viewed during regular museum hours, Tuesday through Saturday from 10AM to 5PM. Call 337-786-2823 for more information or to confirm hours. 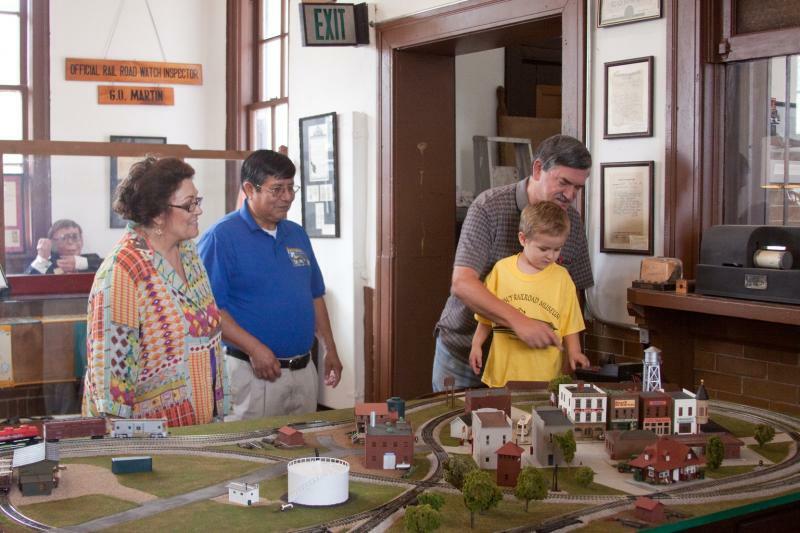 The museum has a working model train that children can activate to watch it run.